Rev. 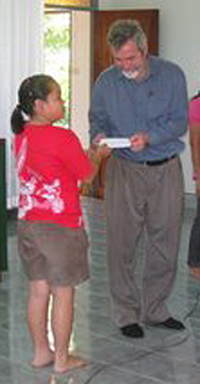 Dr. Leonardo Neitzel receives a donation for Haiti relief from Lutheran church children in Takuapa, Thailand. THAILAND – The congregation in Takuapa in southern Thailand knows the effects of a natural disaster. Many lost family members in the tsunami which struck on December 26, 2004 and survivors received assistance from Lutheran Church–Canada (LCC). Their community became a centre for emergency relief efforts and body identification. Members of churches attending a convention of Igelsia Luterana Sínodo de Nicaragua shortly after the earthquake in Haiti made a similar donation for relief work. Many there had also received disaster assistance through Lutheran Church–Canada in 1998 following Hurricane Mitch. Lutheran Church–Canada’s relief efforts are coordinated with Canadian Lutheran World Relief. You can support these efforts at www.clwr.org/donate .